What Does Code P0006 Mean? The fuel shut off solenoid is used to shut off the fuel supply to the fuel pump. It is typically controlled by the starter via a relay. When the ignition is off, the spring loaded plunger is in the down position, blocking fuel flow to the pump. When the starter is cranked, power is applied to the solenoid from the shut off relay. The plunger is then moved to up position, allowing fuel delivery to the pump. 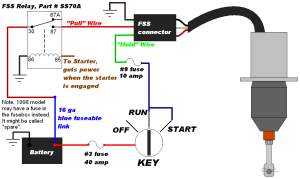 When the ignition switch is released and the engine is running, low amperage current is applied to another winding on the solenoid to keep it in the up position. Code P0006 stands for fuel shutoff valve control circuit low and indicates a problem with the shut off solenoid or its circuit. What are the common causes of code P0006 ? What are the symptoms of code P0006 ? Code P0006 may be accompanied by several different symptoms. These including: an engine that runs poorly, an engine that cranks but will not start and an illuminated check engine light. How do you troubleshoot code P0006 ? This code is often set in error. The first thing to do is clear the code, drive the vehicle and see if it returns. If it does not, the problem is solved. Many problems can easily be found in the harness and connectors. So, begin your diagnosis by visually inspecting the solenoid and its connection. Consult the vehicle repair manual to determine which pin on solenoid connector is the power “pull” wire and which is ground. Then, remove the solenoid and check for proper operation by jumping it. This can be done by attaching jumper wires to the battery or by using a Power Probe (http://www.powerprobe.com/IV/). The plunger should pull up when power is applied. If it does not, the solenoid is faulty and should be replaced. If the fuel shut off solenoid checks out OK, but you still have P0006 code illuminated, you’ll need to check the circuit. 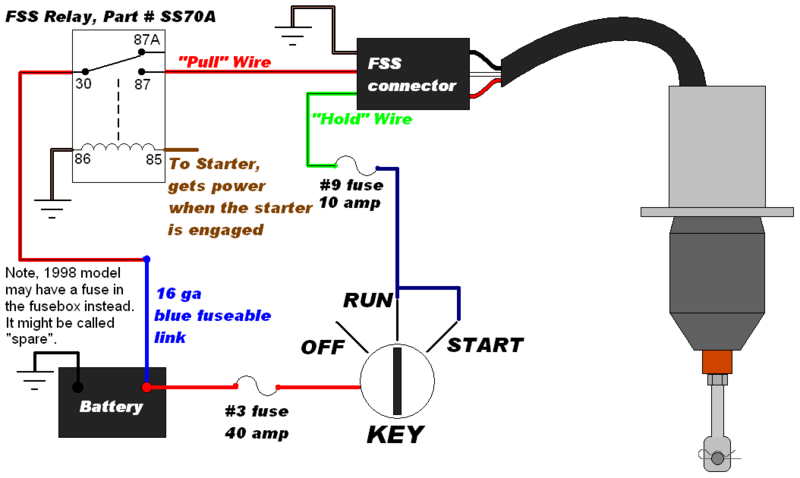 The fuel shut off solenoid should have two or three wires going to it: pull, hold and ground. Consult the repair manual for your vehicle to determine which wire is which. Disconnect the fuel shut off solenoid connector and touch one end of a test light to the “pull” wire pin. Connect the test light clamp to the battery negative post. Crank the engine; the test light should illuminate. If it does not, there is problem in the power supply and you will need to consult the factory wiring diagram. Next, check the “hold” side of the power circuit. Power should only be supplied through this portion of the circuit when the key is in the run position. With the engine running, check for power at the “hold” pin of the fuel shut off solenoid connector. To do this, touch one end of a test light to the “hold” wire pin. Connect the test light clamp to the battery negative post; the test light should illuminate. If it does not, there is problem in the power supply and you will need to consult the factory wiring diagram. To check for ground, disconnect the solenoid connector and touch one end of a test light to the B- pin. Connect the test light clamp to the battery positive post. The test light should illuminate. 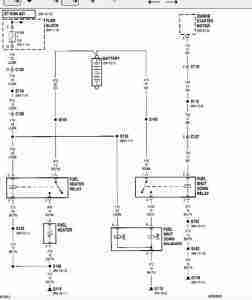 If it does not, there is problem in the ground circuit and you will need to consult the factory wiring diagram. If power is not getting to the fuel shut off solenoid, you’ll want to check the relay. The easiest way to do this is by swapping the relay with another under the hood. Usually the same relay design will be used on multiple circuits, making the swap possible. If the fuel shut off solenoid works with the alternate relay installed, you know the original relay was bad. If you are unable to swap relays you can use a jumper wire to test the relay. Connect a jumper wire or paperclip between the battery feed to the fuel shut off solenoid and power. If the solenoid works, the relay is defective. None found. Ask a question about P0006.